Whether it’s a psychedelic western about a man’s physical and spiritual journey across 19th century America (Dead Man) or a romance about depressed vampires (Only Lovers Left Alive), Jim Jarmusch has never been a filmmaker for the mainstream. His latest is another slow burn, slice-of-life film that’s likely to move half the audience on a deep level and bore the other half to tears. Adam Driver plays the title character, a soft spoken, good-natured, bus driver in Paterson, New Jersey. When he isn’t driving his route and listening to the random everyday conversations from the people riding his bus, he’s finding brief periods of alone time to write a new poem in a notebook he carries with him everywhere. After work he goes home for dinner with his wife, Laura (Golshifteh Farahani). Afterward, he takes her bulldog Marvin out for a walk, stopping only for a short while to have a beer and check in with some of his acquaintances at a local bar. Then it’s back home for bedtime and the process begins again the next morning. Laura is an upbeat person with a never ending well of creative expression. At one point Paterson humorously glances around the living room at the various works of art hanging on the walls. All of them are different styles of painted portrait of their dog Marvin. Without words, we can tell Paterson can’t understand how such an ugly dog could inspire so many works of art. But that’s the charm of this young couple. She makes her own clothes and paints the shower curtain all with the same black and white pattern of circles. She buys a guitar to take some expensive lessons with the hope of becoming the next big country music star. And on top of it all, she’s attempting to get a small cupcake business off the ground. Not once does Paterson try to deter her from any of her numerous creative outlets. And in turn, his love for her and the little moments they get to spend together inspires his creative outlet. Jarmusch gives us a week with Paterson, bookending each segment with title screens that indicate the day of the week. He sets a standard for the expected daily occurrences and then manages to find ways to throw in some unexpected events that slightly sidetrack the routine rather than derailing it entirely. It’s in these brief moments that go outside the norm that we get a better impression of Paterson. He has an easygoing, but very likable personality. He actively encourages his wife to explore her creative side - even if it means having to stomach a disastrous experiment for dinner. But he’s just as generous with the strangers he interacts with in unexpected moments as well. As you might expect, Paterson’s poems are also inspired by the beauty found in the mundane details of everyday life. In that way, they reflect the simplicity of the man who wrote them, yet the way they diverge turn out to be an important detail. Structurally he openly prefers free verse poetry, free from the restrictions of fixed forms, rhythms, and the need to rhyme. 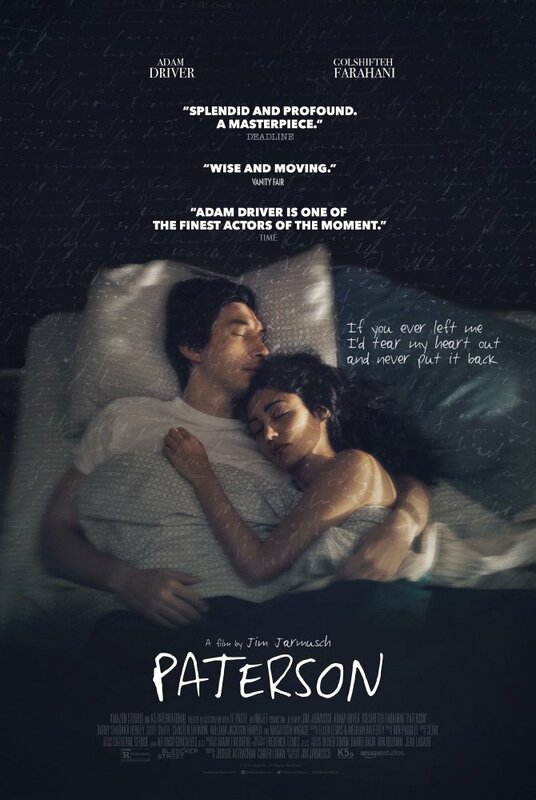 It’s a stark contrast to Paterson’s very structured life. His daily repetition of routine acts like a cage he is only free from in his writing. That’s why he always stays positive when encouraging his wife to explore every creative impulse that enters her head, and ultimately what makes the film’s climax so moving. Despite his wife continually pleading with him to publish his work or at least make copies, we know his work is entirely for him. It’s a creative escape that no one else needs to be a part of. To share it, might be to cheapen it. As a fellow introvert, I know the necessity of creative outlets. They help provide meaning in the midst of pointless everyday tasks - a selfish indulgence despite the restrictions we’re forced to live within. We should all be more like Paterson, aspiring to never squash another person’s creative outlet. I can’t help finding these young people relatable. There’s nothing glamorous about their lives, which makes a film about them all the more unlikely, and Jarmusch’s desire to make the film all the more daring. The beauty is in the minutiae. It’s in the daily routines versus the dreams these ordinary people may or may not have the courage to go after. There are creative people everywhere. Most of them will go unnoticed, but that doesn’t mean their art is without value. Both Adam Driver and Golshifteh Farahani give excellent, understated, natural performances. Farahani is so charming and likable that she lights up the screen every time she appears. However, this is clearly Driver’s film. It’s a very subtle performance, but it’s one of the best I’ve seen from him. He makes Paterson so likable and Jarmusch so carefully puts the time in with him that I came to feel like I knew him. It became impossible not to feel something by the time the film ended. I’ll leave the further analysis to better minds. I’ve never considered Jarmusch a particularly eye-popping visual filmmaker quite the way I do a lot of my other favorite filmmakers, but there is an undeniably rich beauty to his work. Perhaps there was some self reflection here. Paterson’s favorite poet, and his primary inspiration, was Puerto Rican poet William Carlos Williams. He, much like Paterson, was said to have possessed the rare ability to reproduce, in written form, observed details with surprising clarity and beauty. Clearly the art is a reflection of its creator. Jarmusch has a rare ability to capture observed details and reproduce them on film. 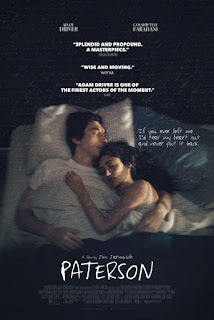 His philosophical slice-of-life films delivered with a dry sense of humor largely remain an acquired taste (especially when it’s applied to his more off-the-wall, or out of this world characters), and that won’t change with Paterson. But as usual, I managed to find something very moving in the beauty of the mundane Jarmusch illustrates here. It feels like life.